This entry was posted in Flowers, Nature and tagged farmland, meadows, Plantlife, Rare Breeds Survival Trust, The Wildlife Trusts, wild flowers. Bookmark the permalink. argylesock says… Here’s a project to restore one of our great British ecosystems. Wildflower meadows are wonderful but too many of them have disappeared. I hope this reseeding will succeed. I’m glad to see this initiative. Wildflower meadows are things of beauty (as well as important environments). 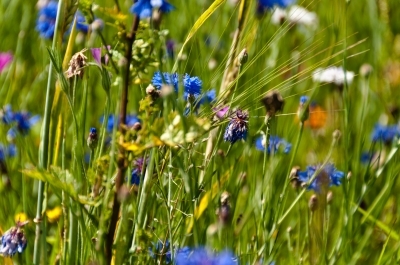 Restoring hay meadows should be part of a whole new governmental approach. It’s time to restore the hay meadows and also the flood meadows. Let’s go back to basics as there are several benefits from such schemes. More flowering plants, more insect life, higher yields on nearby agricultural land and potentially a lower risk of flooding impacts. Good post Tim, I’m slowly catching up on many of the updates and will return. I agree Tony. There’s a hay meadow I often walk through, which is part of a conservation project, and it’s a real joy to see the amount of wild flowers and butterflies there are compared to the rest of our countryside. I would say that place would resemble heaven. Not that I plan to go there any time soon, not the meadow but heaven. In terms of ecosystems, there can’t be anywhere much better than an ancient hay meadow. Has anybody done a bioblitz at the place you mention, it would be fascinating to find out.